Many years ago the modern slots we know them nowadays were quite different and mostly were called fruit machines or bell machines. Indeed, 80 years ago the slots were called one armed bandits and worked mostly by means of tension and strings. However, a lot of water has gone under the bridge. Modern slot design is sure to deviate from that introduced by Charles Fey. Thus, modern manufacturing made slots the most suitable and easy in exploitation. Modern slots make use if the symbols that are eye-catching and easily recognizable like fruit images, letters or various numerals, simple shapes like bells, hearts, diamonds, The newest slots dispose the animated features like pop actors, singers, cartoon images, etc. Modern slots have the specific terms that are to be known to each gambler. There even exists a special slots glossary for those, who want to get acquainted with the modern slots terminology. Terms like slots bonus, candle, coin hopper, credit meter, and low lever are all modern slots terminology. Slot bonus features are considered to be the key features to be involved in the slots gambling. The feature includes the evidences about how the game is played, the rewards provided and particular slots that are used in gambling. Indeed, there are a lot of slots myths in the gambling world that are created mostly by the gamblers themselves. Like any other gambling, slots have the range of slots myths at their disposal that are widely spread among the admirers of this kind of gambling. Random number generator is considered to be really the heart of a slot machine. If the gamer wants to beat the most up to dated machine, he sure has to know how the RNG is working. 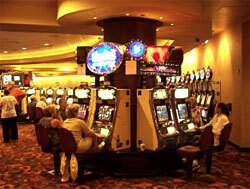 Reels are considered to be the integral part of the slots machine. Traditionally, the physical slots reels may have twenty two images of stops on it, unlike the online casino slots that may consist of from 32 to 256 or even more virtual slots reels. The virtual stops correspond to one of the images on the physical reels. The slots will probably grab the next five numbers from the random number generator in order to store them in the memory, after the player pushes the spin button. In such a way the slots use the very first number for the determining of the first reel, the position of the second for the second reel, etc.